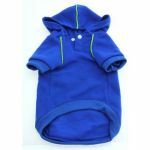 Warm, fleece lined hoodie in a range of bright colours to suit any colour dog. Knitted waist and cuffs, press stud fastening at the neck for easy fitting. Patch pocket and satin piping trim. Lead slit. XS Chest 10-13" length 8 "
S Chest 13-16 " length 10"
M Chest 16 -19" length 11.5 "